Biryani (pronounced [bɪr.jaːniː]), also known as biriyani or biriani, is a South Asian mixed rice dish with its origins among the Muslims of the Indian subcontinent. It is popular throughout the subcontinent and among the diaspora from the region. It is generally made with spices, rice, and meat. The word "biryani" is an Urdu word derived from the Persian language, which was used as an official language in different parts of medieval India, by various Islamic dynasties. One theory is that it originates from "birinj", the Persian word for rice. Another theory is that it derives from "biryan" or "beriyan" (to fry or roast). The exact origin of the dish is uncertain. In North India, different varieties of biryani developed in the Muslim centers of Delhi (Mughlai cuisine), Lucknow (Awadhi cuisine) and other small principalities. In South India, where rice is more widely used as a staple food, several distinct varieties of biryani emerged from Telangana (Specifically Hyderabad), Tamil Nadu, and Karnataka, where minority Muslim communities were present. Andhra is the only region of South India that does not have many native varieties of biryani. According to the Delhi based historian Sohail Nakhwi, more than four thousand years ago, people in Central Asia started adding the meat of cows, buffaloes (beef) and goats (mutton) to rice, thus resulting in the dish that later began to be called Pulao, and a precursor to the modern day Biryani. The more well to do people used the meat of goat (it being more expensive) and the poorer people used beef (it being cheaper). As per author Lizzie Collingham, the modern biryani further developed in the Mughal royal kitchen, as a confluence of the native spicy rice dishes of India and the Persian pilaf. However, all the spices used in biryani were also grown in Persia and were also available to Arabs through trade. According to Kris Dhillon, the modern Biryani originated in Persia, and was brought to India by the Mughals. However, another theory claims that the dish was known in India before the first Mughal emperor Babur came to India. The 16th century Mughal text Ain-i-Akbari makes no distinction between biryanis and pulao: it states that the word "biryani" is of older usage in India. A similar theory—that biryani came to India with Timur's invasion—also appears to be incorrect, because there is no record of biryani having existed in his native land during that period. According to Pratibha Karan, the biryani is of South Indian origin, derived from pilaf varieties brought to India by the Arab traders. She speculates that the pulao was an army dish in medieval India: the armies, unable to cook elaborate meals, would prepare a one-pot dish where they cooked rice with whichever meat was available. Over time, the dish became biryani due to different methods of cooking, with the distinction between "pulao" and "biryani" being arbitrary. According to Vishwanath Shenoy, the owner of a biryani restaurant chain in India, one branch of biryani comes from the Mughals, while another was brought by the Arab traders to Malabar in South India. While the Middle eastern and Middle Asian versions of Biryani and Pulao are made on the tandoor, Biryani in the Indian subcontinent is made in a large metal dish with a narrow mouth called a "degh". Pilaf or Pulao, as it is known in the South Asia and the Indian Subcontinent, is another mixed rice dish popular in Indian, Pakistani and Middle Eastern cuisine. Opinions differ on the differences between pulao and biryani, and whether there is a difference between the two at all. According to Delhi-based historian Sohail Nakhvi, Pulao tends to be (comparatively) plainer than the biryani and consists of either vegetables or meat cooked with rice. Biryani on the other hand contains more gravy (due to the use of yakhni in it), is often cooked for longer (hence yielding more tender meat or vegetables) and with additional condiments. Pratibha Karan states that while the terms are often applied arbitrarily, the main distinction is that a biryani comprises two layers of rice with a layer of meat (or vegetables) in the middle; the pulao is not layered. Biryanis have more complex and stronger spices, compared to pulao. The British-era author Abdul Halim Sharar mentions this as the primary difference between biryani and pulao: the biryani has a stronger taste of curried rice due to a higher amount of spices. Ingredients vary accord to type of meat used and the region the Biriyani is from. Gosht (of either chicken or mutton) as the prime ingredient with rice. As is common in dishes of the Indian subcontinent, some vegetables are also used when preparing Biriyani. Other vegetables such as corn also may be used depending on the season and availability. Navratan biryani tends to use sweeter richer ingredients such as cashew, kismis and fruits such as apples and pineapples. The spices and condiments used in biryani may include ghee (clarified butter), nutmeg, mace, pepper, cloves, cardamom, cinnamon, bay leaves, coriander, mint leaves, ginger, onions, and garlic. The premium varieties include saffron. In all Biriyani, the main ingredient that accompanies the spices is the chicken and mutton, special varieties also use beef, and seafood. The dish may be served with dahi chutney or raita, korma, curry, a sour dish of aubergine (brinjal), boiled egg (optional), and salad. In the kacchi biryani, raw marinated meat is layered with raw rice before being cooked together.It is also known as kacchi yeqni. 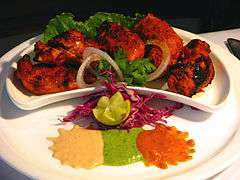 It is cooked typically with chicken and mutton but rarely with fish and prawn. The dish is cooked layered with the meat and the yogurt based marinade at the bottom of the cooking pot and the layer of rice (usually basmati rice) placed over it. Potatoes are often added before adding the rice layer. The pot is usually sealed (typically with wheat dough) to allow cooking in its own steam and not opened until it is ready to serve. Tahari, Tehri or Tehari are variants on the name given to the vegetarian version of Biryani. It was developed for the Hindu bookkeepers of the Muslim Nawabs. It is prepared by adding the potatoes to the rice as opposed to the case of traditional Biryani, where the rice is added to the meat. In Kashmir, Tehari is sold as street food. Tehri became more popular during World War II, when meat prices increased substantially and potato became the popular substitute in Biryani. It is not really considered to be part of the Biriyani family in its true sense. Beef biryani, as the name implies, uses beef as meat. In Hyderabad, it is famous as Kalyani biryani, in which beef (buffalo meat) is used in preparing the Kalyani biryani. This meal was started after the Kalyani Nawabs of Bidar came to Hyderabad sometime in the 18th century. The Kalyani biryani is made with small cubes of beef, regular spices, onions and lots of tomatoes. It has a distinct tomato, jeera, dhania flavour. In Kerala, beef biryani is very famous. 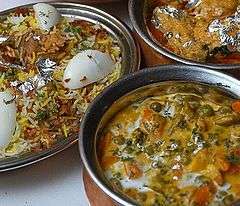 Depending on the region and the condiments available and popular in that region, there are different varieties of Biryani. The variety often takes the name of the region (for example, Sindhi Biryani developed in the Sindh region of what is now Pakistan, Hyderabadi biryani developed in the city of Hyderabad in South India, etc.). Some have taken the name of the shop that sells it (for example: Students Biryani in Karachi, Lucky Biryani in Bandra, Mumbai and Baghdadi Biryani in Colaba, Mumbai). Biryanis are often specific to the respective Muslim community from where it comes, as it is usually the defining dish of that community. Cosmopolitanism has also created these native version to suit the tastes of others as well. The Delhi version of the Biryani developed with a unique local flavor as the Mughal kings shifted their political capital to the North Indian city of Delhi. Till the 1950s, most people cooked biryani in their house and rarely ate out. Hence, restaurants primarily catererd to travelers and merchants, hence any region that saw more of these two classes of people nurtured more restaurants, and thus their own versions of biryani. As per Nakhwi, this was the reason why most shops historically selling biryani in Delhi tend to be near mosques such as Jama Masjid (for travelers) or traditional shopping districts (such as Chandni Chowk). Each part of Delhi has its own style of biryani, often based on its original purpose thus giving rise to Nizamuddin Biryani, Shahjahanabad biryani, etc. The Nizamuddin Biryani is usually sparse in the more expensive meat and spices as it was primarily meant to be made in bulk for offering at the Nizamuddin Dargah shrine and thereafter to distribute to devotees. A non-dum using a lot of green chillies variety of Biryani popularized by the Babu Shahi Bawarchi shop located outside National Sports Club, Delhi is informally called Babu Shahi Biryani. Another version of Delhi biryani uses achaar (pickles) and is called "Achaari Biryani". The exotic and aromatic Sindhi Biryani is known in Pakistan for its spicy taste, fragrant rice and delicate meat. Sindhi Biryani is a beloved staple in food menus in the Pakistani cuisine and Sindhi cuisine. Sindhi Biryani is prepared with meat and an amalgamation of Basmati rice, vegetables and various types of spices. Sindhi Biryani is often served by Pakistan International Airlines (PIA) in most of their international flights. A special version of Sindhi Biryani sold by a shop in Karachi called "Students center" is popularly called "Students Biryani". Hyderabadi Biryani is one of India's most famous Biryanis; some say Biryani is synonymous with Hyderabad. The crown dish of the Hyderabadi Muslims, Hyderabadi biryani developed under the rule of Asaf Jah I, who had been appointed as the Governor of Deccan by the Mughal emperor Aurangzeb. It is made with basmati rice, spices and goat. Popular variations use chicken instead of goat. There are various forms of Hyderabadi biryani. One such biryani is the kachay gosht ki biryani or the dum biryani, where the mutton is marinated and cooked along with the rice. It is left on slow fire or dum for a fragrant and aromatic flavour. Malabar Biryani, is the only variation of Biryani found in the Indian state of Kerala. It is one of the many dishes of the Malabar Muslim community, and a very popular one at that. The ingredients are chicken, spices and the specialty is the choice of rice named Khyma. Khyma rice is generally mixed with ghee. Although a huge amount of spices such as mace, cashew nuts, sultana raisins, fennel-cumin seeds, tomato, onion, ginger, garlic, shallot, cloves and cinnamon are used, there is only a small amount of chili (or chili powder) used in the preparation. A pakki biryani, the Thalassery biryani uses a small-grained thin (not round) fragrant variety of rice known as Khyma or Jeerakasala. The dum method of preparation (sealing the lid with dough (maida) or cloth and placing red hot charcoal above the lid) is applied here. Calcutta or Kolkata biryani evolved from the Lucknow style, when Awadh's last Nawab Wajid Ali Shah was exiled in 1856 to the Kolkata suburb of Metiabruz. Shah brought his personal chef with him. The poorer households of Kolkata, which could not afford meat, used potatoes instead, which went on to become a specialty of the Calcutta biryani. The Calcutta Biryani primarily uses potatoes and eggs. The Calcutta biryani is much lighter on spices and sometimes contains meat. The marinate primarily uses nutmeg, cinnamon, mace along with cloves and cardamom in the yoghurt based marinade for the meat which is cooked separately from rice. This combination of spices gives it a distinct flavour as compared to other styles of biryani. The rice is flavoured with ketaki water or rose water along with saffron to give it flavour and light yellowish colour. Ambur/Vaniyambadi biryani is a type of biryani cooked in neighboring towns of Ambur & Vaniyambadi in the Vellore district in the north-eastern part of Tamil Nadu, which has a high Muslim population. It was introduced by the Nawabs of Arcot who once ruled the place. The Ambur/Vaniyambadi biryani is accompanied with 'dhalcha', a sour brinjal curry and 'pachadi' or raitha, which is sliced onions mixed with plain curd, tomato, chillies and salt. It has a distinctive aroma and is considered light on stomach and the usage of spice is moderate and curd is used as a gravy base. It also has a higher ratio of meat to rice. 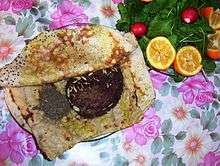 The is an integral part of the Navayath cuisine and a speciality of Bhatkal, a coastal town in Karnataka. Its origins are traced to the Persian traders who left behind not only Biryani but a variation of kababs and Indian breads. Bhatkali Biryani the meat is cooked in an onion and green chilli based masala and layered with fragrant rice. The Bhatkali biryani has a unique spicy and heady flavour, the rice is overwhelmingly white with mild streaks of orange. Though similar to the ones in Thalassery and Kozhikode, the biryani differs with lingering after-notes of mashed onions laced with garlic, a few chillies and spices littered with curry leaves does lend a unique flavour to Bhatkal Biryani also not a drop of ghee or other oil additives on any morsel of rice..
Memoni biryani is an extremely spicy variety developed by the Memons of Gujarat-Sindh region in India and Pakistan. It is made with lamb, yogurt, fried onions, and potatoes, and fewer tomatoes compared to Sindhi biryani. Memoni biryani also uses less food colouring compared to other biryanis, allowing the rich colours of the various meats, rice, and vegetables to blend without too much of the orange colouring. The Dindigul town of Tamil Nadu is noted for its biryani, which uses a little curd and lemon juice to get a tangy taste. Kalyani biryani is a typical biryani from Hyderabad. Also known as the 'poor man's' Hyderabadi biryani, the Kalyani biryani is always made from small cubes of buffalo meat. The Kalyani biryani is supposed to have originated in the Bidar during the reign of the Kalyani Nawabs, who migrated to Hyderabad after one of the nawabs, Ghazanfur Jang married into the Asaf Jahi family. The Kalyani biryani was served by the Kalyani nawabs to all of their subjects who came from Bidar to Hyderabad and stayed or visited their devdi or noble mansion. This was the practice for many decades. But after Operation Polo in which the Indian army took over Hyderabad State, the state of the nobles went into decline. Some of their illustrious cooks set up their own stalls and introduced the Kalyani biryani to the local populace of Hyderabad. A different dish called "Biryan" is popular in Afghanistan. Biryan traces its origins to the same source as Biryani, and is today sold in Afghanistan as well as in Bhopal, India. Biryan is prepared by cooking Gosht and rice together, but without the additional gravy (Yakhni) and other condiments that are used in Biryani. The Delhi based historian Sohail Hashmi refers to the Biryan as midway between the Pulao and Biryani. The Afghani biryani tends to use a lot of dry fruit and lesser amounts of meat, often cut in tiny pieces. In Myanmar (Burma), biryani is known in Burmese as danpauk or danbauk, from Persian dum pukht. Featured ingredients include cashew nuts, yogurt, raisins and peas, chicken, cloves, cinnamon, saffron and bayleaf. In Burmese biryani, the chicken is cooked with the rice. 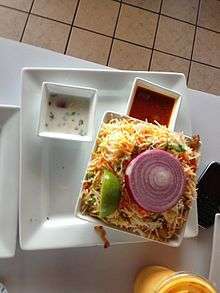 biryani is also eaten with a salad of sliced onions and cucumber. One form of "Arabic" biryani is the Iraqi preparation (برياني: "biryani"), where the rice is usually saffron-based with chicken usually being the meat or poultry of choice. Most variations also include vermicelli, fried onions, fried potato cubes, almonds and raisins spread liberally over the rice. Sometimes, a sour/spicy tomato sauce is served on the side (maraq). Nasi kebuli is an Indonesian spicy steamed rice dish cooked in goat broth, milk and ghee. Nasi kebuli is descended from Kabuli Palaw which is an Afghani rice dish, similar to biryani served in South Asia. Wikimedia Commons has media related to Biryani. ↑ "Where does biryani come from?". blogs.hindustantimes.com. Retrieved 2016-07-14. ↑ Naqvī, Ṣādiq; Rao, V. Kishan; Satyanarayana, A. (2005). A thousand laurels--Dr. Sadiq Naqvi: studies on medieval India with special reference to Deccan. 1. Felicitation Committee, Dept. of History & Dept. of Ancient Indian History, Culture & Archaeology, Osmania University. p. 97. ↑ de Laet, Siegfried J. (1994). History of Humanity: From the seventh to the sixteenth century. UNESCO. p. 734. ISBN 9789231028137. 1 2 3 Pratibha Karan (2009). Biryani. Random House India. pp. 1–12 and 45. ISBN 978-81-8400-254-6. ↑ "biryani: definition of biryani in Oxford dictionary (American English) (US)". www.oxforddictionaries.com. Retrieved 2016-07-15. ↑ Cannon, Garland Hampton; Kaye, Alan S. (2001). The Persian Contributions to the English Language: An Historical Dictionary. Otto Harrassowitz Verlag. p. 71. ISBN 9783447045032. ↑ Anoothi Vishal (2011-05-14). "When rice met meat". Business Standard. ↑ "10 Best Biryani Recipes - NDTV Food". Retrieved 2016-06-24. ↑ Lizzie Collingham (6 February 2006). Curry: A Tale of Cooks and Conquerors. Oxford University Press. p. 27. ISBN 978-0-19-988381-3. ↑ Kris Dhillon (2013). The New Curry Secret. Little, Brown Book Group. p. 234. ISBN 978-0-7160-2352-4. 1 2 3 4 Vir Sanghvi. "Biryani Nation". Retrieved 2014-08-24. ↑ Mukund Padmanabhan; Subash Jeyan; Subajayanthi Wilson (2012-05-26). "Food Safari: In search of Ambur Biryani". The Hindu. Retrieved 2014-08-24. 1 2 3 4 5 Priya Ganapati (2004-04-09). "Of biryani, history and entrepreneurship". rediff.com. Retrieved 2014-08-27. 1 2 3 Holly Shaffer (2012). "6: Dum Pukht". Curried Cultures: Globalization, Food, and South Asia. Edited by Krishnendu Ray and Tulasi Srinivas. University of California Press. pp. 124–. ISBN 978-0-520-27011-4. ↑ Colleen Taylor Sen (2014). Feasts and Fasts: A History of Food in India. Reaktion Books. pp. 194–195. ISBN 9781780233918. ↑ Sangeeta Bhatnagar; R. K. Saxena (1 January 1997). Dastarkhwan-e-Awadh. HarperCollins Publishers, India. ISBN 978-81-7223-230-6. ↑ ʻAbdulḥalīm Sharar (1989) . Lucknow: The Last Phase of an Oriental Culture (Hindustan Men Mashriqi Tamaddun ka Akhri Namuna). Translated by ES Harcourt; Fakhir Hussain. Oxford University Press. ISBN 978-0-19-562364-2. 1 2 3 Brown, Ruth. (17 August 2011) "The Melting Pot – A Local Prep Kitchen Incubates Portland's Next Generation of Food Businesses." Willamette Week. Volume 37, #41. ↑ ScoopWhoop (2016-09-24). "Veg Biryani Is Not Biryani. I Wish People Would Just Stop Calling It That". ScoopWhoop. Retrieved 2016-10-29. ↑ "The Other Hyderabadi Biryani With a 300-Year-Old Past". ↑ "A tale of two biryanis". ↑ "Why Kalyani Beef Biryani Is a Favourite of Many Hyderabadis, Muslim and Hindu". ↑ "In fact: How beef became Malayalis' object of desire". ↑ "Where does biryani come from? : Rude Hotels". blogs.hindustantimes.com. Retrieved 2016-10-20. ↑ Karan, Pratibha (March 30, 2009). Biryani. Delhi: Random House (India). ISBN 8184000936. Retrieved 19 October 2016. ↑ "10 Cities In India For The Food Lover's Soul". 2014-12-05. Retrieved 2016-07-26. ↑ Staff, WSJ. "India's Best City For Biryani Is…". WSJ. Retrieved 2016-05-16. ↑ Abdulla, Ummi (1993). Malabar Muslim Cookery. Orient Blackswan. p. 2. ISBN 8125013490. ↑ Mukund Padmanabhan, Subash Jeyan and Subajayanthi Wilson (26 May 2012). Food Safari : In search of Ambur biryani. The Hindu. ↑ Biryani bistro. The Hindu (11 March 2010). Retrieved on 2012-12-28. ↑ "Stuff of memories". The Hindu. Chennai, India. 10 February 2008. ↑ Pham, Mai. "The Burmese Way / A visit to the land of pagodas and enchanting cuisine". The San Francisco Chronicle. Burmese chicken biryani differs from its Indian counterpart: the chicken is cooked with the rice. ↑ pt. kompas cyber media (2014-07-06). "Sajian Kebuli, Mandi, dan Biryani". Kompas.com. Retrieved 2014-08-24.